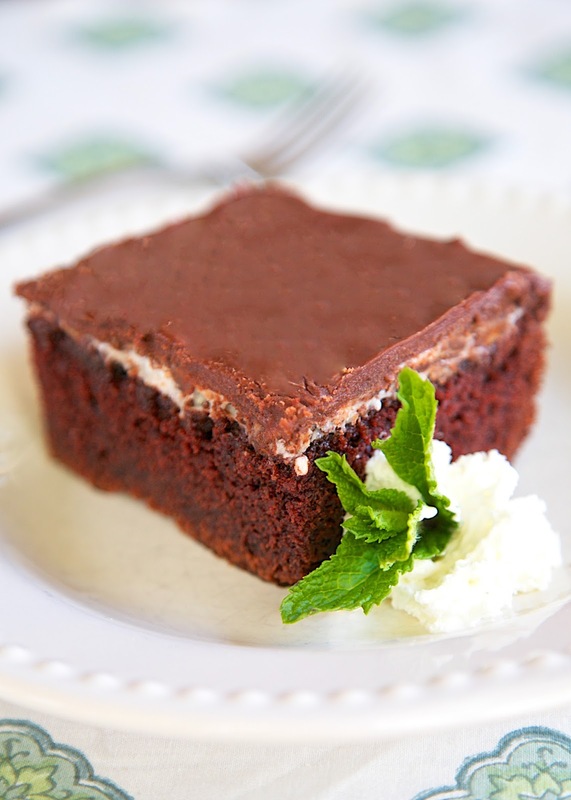 Grandma's Hint of Mint Cake Recipe - quick homemade chocolate cake, topped with Peppermint Patties and a homemade chocolate frosting. Great for a potluck dinner - super easy to transport. We like it with a scoop of vanilla ice cream! 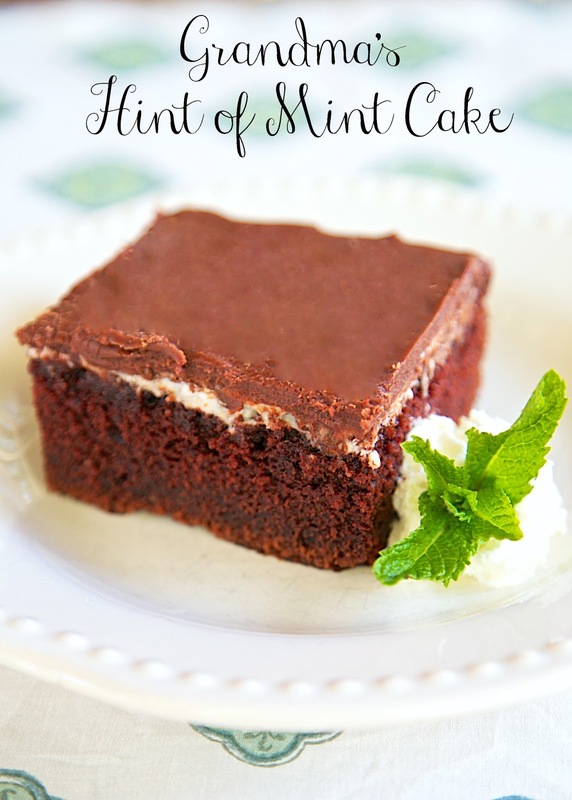 Chocolate cake with a hint of mint and a decedent chocolate frosting? Sign me up! I made this cake for our #TwitterSupperClub dinner. It was a huge hit. It is a quick homemade chocolate cake, topped with Peppermint Patties and a homemade chocolate frosting. Or, as I like to say, heaven! This cake is perfect for a potluck dinner. It is simple and easy to transport. It is pretty rich, so you don't need a huge piece. It is especially good with a scoop of vanilla ice cream! This would be a great addition to any upcoming Memorial Day parties. Preheat oven to 350 degrees. Grease and flour a 9x13-inch pan and set aside. Combine flour, sugar, cocoa and cinnamon in a bowl. Set aside. In a saucepan, combine butter and water ,cook over low heat until butter is melted. Removed from heat. Stir in baking soda. Add to flour mixture, stirring to combine. Combine egg, buttermilk and vanilla. Stir into flour mixture. Spread batter into prepared pan. Bake for 40 minutes. Remove cake from oven. Top with halved peppermint patties. Bake for an additional 2-3 minutes, until patties are melted. Gently spread melted candies over top of cake. Allow to cool. Combine butter and milk in a saucepan. Cook over low heat until butter is melted. Remove from heat. Stir in powdered sugar and cocoa powder. Continue stirring until smooth. Stir in vanilla. Spread over cooled cake. Um, yeah. I can vouch for it. AMAZING.